Many of you know that I have sung the praises of Zoos Victoria and the Zoos Victoria Foundation many times. 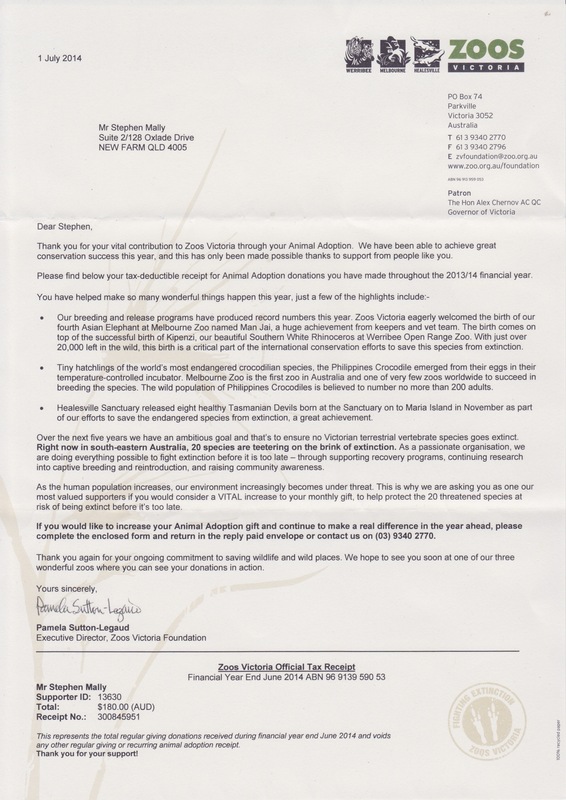 Today, I received an outstanding year-end tax receipt from Zoos Victoria Foundation. It contained some important requests that I think ought to be highlighted. 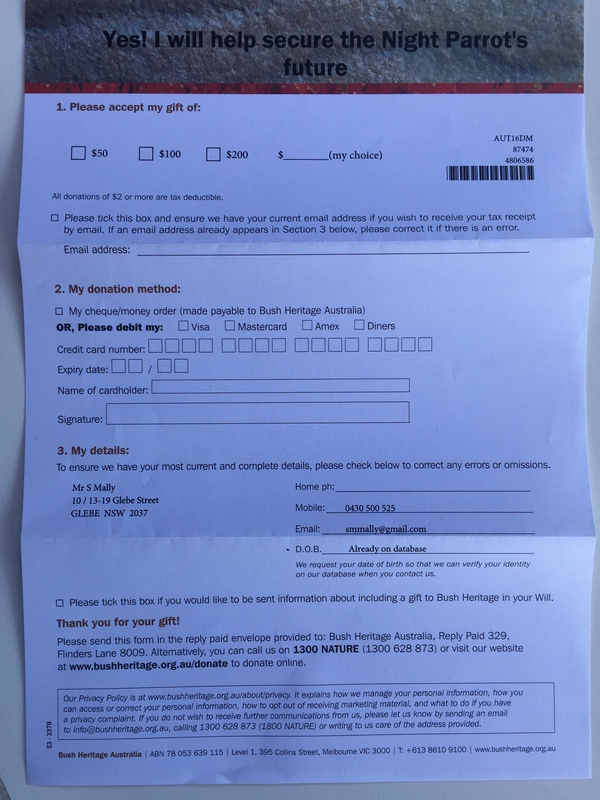 Zoos Victoria Foundation asked me to upgrade my monthly support, make an additional one-time gift, and to update my contact details if my details are different than those the Zoo holds in the database. First, the piece is an outstanding donor care piece. 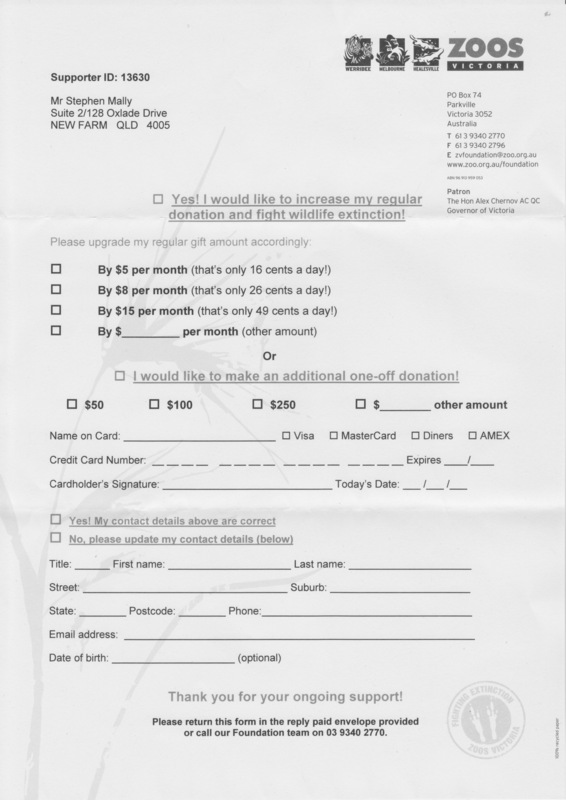 Zoos Victoria, in the letter, makes it clear that the organisation values my financial support. The letter reads “you have helped make happen so many wonderful things this year, just a few of the highlights include…”. Zoos go on to tell me several key achievements for the year. The Zoo convinces me that it is because of my support that these things happen. You and I know that my $180 did not make this happen, but the Zoo does not pretend for a second that my donations alone were cause for this activity. Instead, my support helped. The Foundation asks me to make an increase and suggests additional support is vital. The Foundation clearly states a sense of urgency. The response form the Zoo encloses is just as important as the letter itself. On the form, the Zoo offers me an opportunity, again, to increase my monthly gift and, if this is not possible, to make an additional one-time gift. In the ask to increase my monthly gift, the Zoo points out the amount it will cost me in cents (16 cents) per day. This puts the ask in very real terms. Most people can afford an additional 16 cents per day. There is one more thing I really like about this form. There is an additional request of me to confirm, edit and enhance my contact details. Those of you who know me know I preach CEE – Confirm(C), Edit (E) and Enhance (E) each time I work with customers. We must confirm contact details each opportunity we have when in touch with constituents. Additionally, we must give constituents the ability to edit any detail that is erroneous. And, finally, we need to strive to enhance any details missing. In the case of the Zoo, my name and address are correct. The organisation appears to be missing my email address and telephone number – two details I may wish to provide. Zoos Victoria Foundation, through their end of year receipt, offer me the chance to upgrade my support. Additionally, there is an opportunity to give a one-time gift and, again, to verify my details are correct, to update them, and to offer additional details. One might argue this one form kills many birds with one stone. The real purpose of the form is to send me my tax receipt. But, it accomplishes so much more. I often times suggest organisations should compare themselves against organisations of all shapes and sizes. Whether your organisation is a cultural organisation or a conservation organisation does not matter. The important thing is that you look to the Zoo, and others out there, for solid examples of donor engagement and donor care. The Zoo provides shining examples for many.